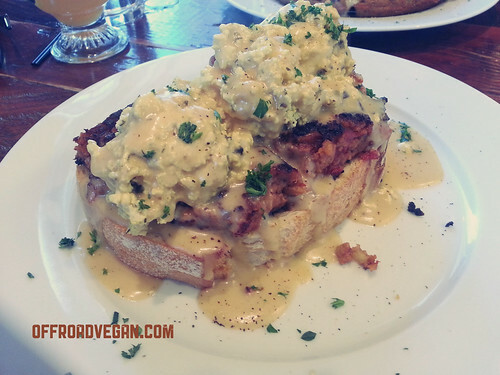 As many people know, brunching in Portland is something of an olympic sport. It is part of our heritage, much like good espresso, grey Winter days, and cold craft beer. And, just like never owning an umbrella, people have come to look at standing in a long line as something that actually defines a true Portlander. So, when you can find an amazing vegan brunchery (not a word until just now) with not much of a wait, it is like the heavens have opened up and a thousand angels are singing. This sign beckons me in my dreams. Is that creepy? A.N.D. Cafe rarely has a long line of hungry souls, but that is not due to the food, atmosphere, or service. I tend to think it is due to being “farther out” on Burnside than most fixie riders are willing to go. Let them have the Screen Doors and Tin Sheds of the World. 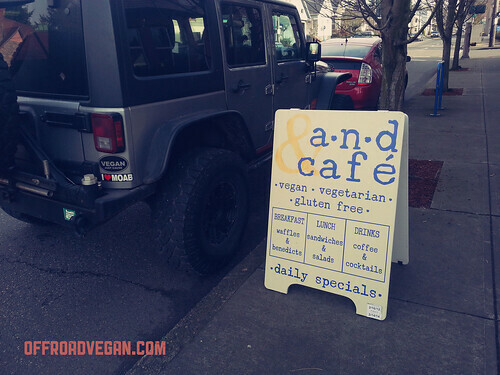 We’ll fill up the Jeep and barrel her down Burnside for some of the best vegan food Portland has to offer. A.N.D. Cafe is, by default vegan. However, upon request, vegetarians and omnis can elect to have eggs and dairy cheese subbed. 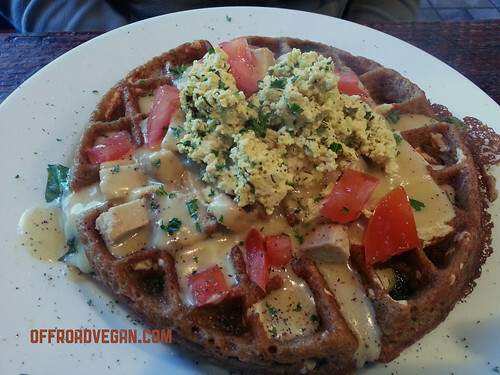 The Florentine waffle is an amazing choice, with chicken (Beyond Meat), gravy, scrambled tofu, hollandaise, and tomatoes. It also is stuffed with cheese (I’m thinking Daiya) and spinach. Just today I tried the Buffalo Blue Hoagie, a buffalo chicken (ala Beyond Meat) sandwich with homemade blue cheese and spinach. The soft, velvety bread makes this easy to eat. 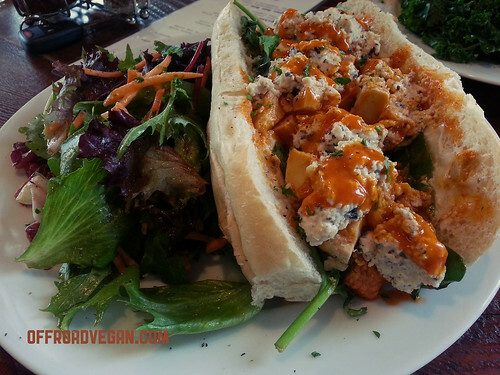 It is a top contender for possibly being one of my favorite all-time vegan sandwiches. And I don’t just throw that around all willy-nilly. The best vegan sammy in ALL of Portland? The Buffalo Bleu Hoagie. 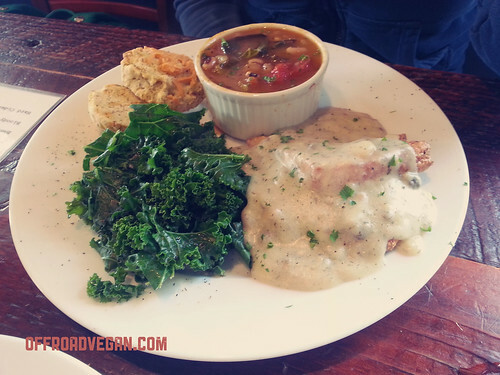 Melanie ordered their special today, which was a fried tofu cutlet with gravy, kale and cheddar jalapeno corn bread. She liked it, but made the mistake of trying my chicken sammy first. Once she had that, the bar was set too high for the tofu cutlet to keep up. Service is short, brisk, and very pleasant which is really what you want in a place like this. I don’t have time for clingy waiters and waitresses – get my order right, bring me my food, check on me from time to time, and let me free up that table for the next hungry group. The people at A.N.D. Cafe are always great. In conclusion, this place is a pillar of the vegan scene in PDX and should never be missed. If you are a vegan in town and have not been here yet, GO THERE. Make it a regular stop. If you have out of town guests, take them here and blow their minds. Fantastic review. It looks like they have more stuff I’d be interested in trying since the last time I was there. Thanks for the recap! YES! This place is amazing!! That buffalo hoagie sandwich looks freakin AMAZING, but that florentine waffle looks equally delish. Thanks for sharing this awesome find Scott. We’ll be sure to add AND cafe to our Store Locator page! Thanks Beyond Meat! We heart you guys and what you are doing in the analog space! Keep up the deelish work and follow my blog! We most SOY-tenly will! Thanks for all of your support Scott. Keep an eye out for an email from us and have a great weekend! Looking back, the “Soy” joke was not funny. at. all.